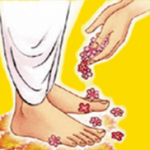 Categories: G jayanti, Mahans, Sri Sri Muralidhara Swamiji. Our birthdays are celebrated within our circle of family and friends. Birthdays of leaders and politicians are celebrated by larger groups of people and by entire regions. The birthday of a motherland is celebrated by an entire nation. Festive days such as Deepavali and Navaratri are celebrated by millions of people, not just within a nation, but across the world. Special days such as New Year’s Day, Mother’s Day, and Valentine’s Day are celebrated universally by everyone in the whole world. However, it is said that the “jayanti” or the day of birth of mahatmas and sadhus is cause for joyous celebration, not just in this world, but even in the higher realms and the heavens. Because it is only through them that humanity is truly uplifted. 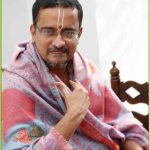 The Chintamani gem (philosopher’s stone) can fulfill only our worldly desires; the Kalpakavruksha (wish-fulfilling tree) can give us even the comforts of heaven but no more; however, the highest abode of Vaikuntam, which is rare even for Yogis, is attained by one who has earned the affection of the Guru! On October 27 this year, as the Swati star is on the rise, we celebrate the 50th jayanti of our beloved Guru Maharaj, His Holiness Sri Sri Muralidhara Swamiji. Born in Cuddalore in the south Indian state of Tamil Nadu in 1961, Sri Swamiji’s constant yearning, right from childhood, for the Lord and the company of sadhus, only intensified through the years as he grew up. 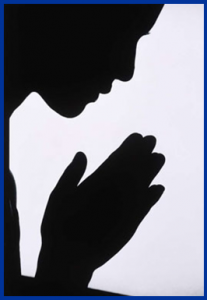 Although he underwent regular school and college education, his heart continued to long for God and this led him to eventually lead an itinerant life of solitude and meditation, lost in the bliss of love of the Lord. After several such years, by the Lord’s will, Sri Swamiji began to spread the fragrance and sweetness of bhakti through his interactions with people, his numerous kirtans and compositions, and simply by himself being immersed constantly in the ocean of devotion. However, the rampant misery, strife and disharmony in the world and an obvious lack of inner peace in people moved him immensely. Knowing that spirituality is the only way to find that inner peace, and acknowledging that the path shown by every religion, every kind of sadhana and by every mahatma leads only to this same inner peace, Sri Swamiji shows an extremely simple and effective path to the same goal. 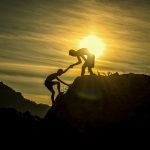 He advocates that the easiest way to experience harmony—both within oneself and in the world—is by realizing that all of us are only little children of the same, one God and to call out to Him by His Name. As demonstrated by the lives of innumerable saints down the ages and by so many people living even today around us, calling out to God by chanting His Divine Name automatically transforms us from within. It cleans our hearts and minds effortlessly so that everlasting happiness and universal love can flower inside us. And when this happens to every person, then the feeling of brotherhood too blossoms on its own. Our scriptures have prescribed the Mahamantra—Hare Rama Hare Rama Rama Rama Hare Hare, Hare Krishna Hare Krishna Krishna Krishna Hare Hare—as the panacea for the ills of this Age. This mantra, which has no restrictions of time, place or person, is the one that is also advocated by Sri Swamiji. 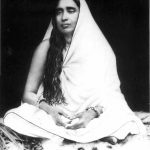 He exhorts everyone—irrespective of religion, creed or philosophy—to chant the Mahamantra as often as possible, for fulfillment of desires, for inner peace and to help accelerate spiritual progress in their own path. Sri Swamiji travels widely within India, conducting mass prayers with Mahamantra chanting, giving spiritual discourses, and often simply lending a sympathetic ear to the problems of villagers and city-folk alike. 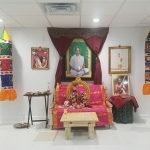 He has established several Namadwaars (sanctums where the Mahamantra is chanted continuously) in India and around the world, including one in Houston, TX in the USA. Sri Swamiji also spends his energy towards the renovation and maintenance of ancient temples and running Veda patashalas to preserve our Vedic heritage. When not travelling or involved in showering his love and compassion on all those who come to him, Sri Swamiji is usually found doing what he enjoys the most – absorbed in loving, celebrating and worshipping the Lord. At his Madhurapuri Ashram, located in a village near Chennai, India, daily devotional worship of Sri Premika Varadan (Lord Krishna) and Sri Madhuri Sakhi (Radha Devi), Sri Kalyana Srinivasa Perumal (Lord Balaji) and the 24-foot Kanyakumari Sri Jaya Hanumanji, is performed. On the occasion of Sri Swamiji’s 50th jayanti, we offer our humble prostrations to our loving and compassionate Guru Maharaj. While the world and other lokas celebrate the appearance day of mahatmas, the mahatmas themselves, instead of rejoicing, remain constantly restless in their unfathomable desire to shower compassion, ease suffering and uplift all of humanity. What can we give such a person on this auspicious day except to simply do his bidding and chant the Mahamantra? Vedantha Athichoodi – Aushadamam Bhagavan Namam! 2 Responses to "50 YEARS OF A LIFE OF LOVE"
Nan nam Guruji-kku Mahamantram chant pannuvathivida veru okndrum seiyyavemudiyathu. Guruji KRUBAI and Smaranamthan eppothum saanthosam kodukkirathu. Radhe Radhe! Well written Jayanthi message, capturing the synopsis of our beloved Sri. Swamiji’s life and mission!